My fascination with the Tenere probably started after reading the alluringly sparse route descriptions in the old Sahara Handbook in the early 1980s. After several stillborn attempts resulting in a clearly inadequate description in my own book I decided it was time to cough up two grand and take a tour – enjoying a relaxed recce that would not put my nice Toyota at risk (there appears to be a currently increasing risk of loosing your car in this area). Looking at various itineraries and prices I chose Suntours, a German operator long established in the region. Although I may have communicated better with a French-speaking group (I don’t speak German), Suntours’ 22-day itinerary looked the most thorough (although this itinerary, featured on their web page, did not match the actual one offered, missing out Enneri Blaka). I met the group at Paris and we flew straight down the Tanezrouft (no window seat, alas…), reaching Niamey at sunset where it transpired half of the group of nine’s baggage was missing. Next day we had to hang around in Niamey on the hope that more bags might turn up from Abidjan that evening. Like most sub-Sahara capitals, Niamey is not what you come to Africa for, but for 20p the museum was a bargain, while brochettes at sunset on the terrace of the Grand Hotel is the done thing among toubabs in the know. That night a few more bags turned up and with three missing, it was decided to take the 1000-km drive to Agadez overnight – the luggageless ones would have to make do. This part of the trip is a drag. Flying direct to Agadez from Paris would be ideal though I can see why Suntours don’t trust the Le Pointe charters. The American Tour that got nabbed at Temet (see below) suffered a late Le Pointe cancellation on the way out and they all had to pay up for a scheduled flight (though Agadez’s runway – since rebuilt at Libya’s expense) could have been to blame here). As it happens the night drive in two minibuses was not so bad as most of us could stretch out on a bench seat and get some sleep. Leaving around midnight we got to Agadez thirteen hours later for lunch at Ewaden Voyages, the local partner of Suntours. Soon after, two old Cruisers and a Patrol were loaded up and we headed out of town for the hills of the Air. I’d been warned that I’d find the Air a rough and dull drive – not the real Tenere. In fact it was quite satisfying – on the way out at least. Tuareg activity is prolific, these dudes really do wander around from village to village on camels with their takouba swords by their side! I’ve never encountered the semi-sedentary Kel Aïr Tuareg before but now realise how much of the Tuareg mythology might be based on the colourful culture of this accessible clan. 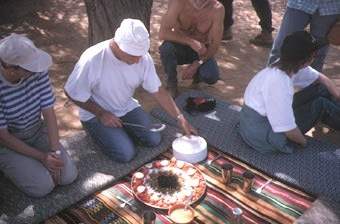 We camped in a oued (“never camp in a oued!”) where Ibrahim cooked the first of many truly spectacular meals. How long could this last I wondered, and sure enough by the time we got to the Kaouar settlements in the east, things got a bit plain, but the presentation of his outstanding lunch time salads were works of art, composed of fresh ingredients for much longer than you’d expect in fridge-free motoring. Another great aspect of this tour was letting us loose on foot down the track while the morning (and sometimes lunchtime) camp was packed up by the crew. With a bit of luck one could get a quiet couple of miles under one’s soles before the cars caught up. No one could have complained too much time was spent cooped up in the cars, although the constant attention the old dogs needed added frequent cig’ breaks. Indeed on the whole trip I doubt if we drove half an hour without one car stopping to fix something. That said it was soon clear these drivers drove their vehicles with care – a first for me in Africa. I was in the Patrol where Madougou treated the machine like his own and I’d have been happy for him to drive my car (and if you know most desert drivers, that’s quite an admission!). 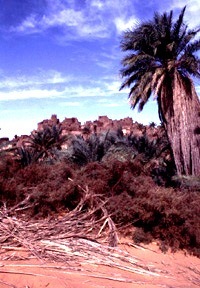 The southern Air is a Sahel of low reddish hills which darken and rise towards Timia and the volcanic extrusions thereabouts. Settlements and nomadic encampments focus round the gravely oueds, some with nearby gardens and enclosures. You’re never far from others in the Air. With the very frequent stops I got the impression we were hung out to dry with the cadeau-crazed village kids a little too long for comfort, as if it was pre-arranged that we would crack and splash out on Tuaregobilia in these places. By the time we got to Timia I sensed the group had had enough, and being sent off on a futile tour of this unremarkable village had us pining for the desert. “Connais-vous Alex Marr” one young boy asked me. Well, as it happened I did. Although like most people, I’ve never actually met him, Alex contributed to my recent books and came through here on the way to Bilma in ’99, thinking he could ride from there to the Lake because of a black line on the Mich map. I had the novel experience of receiving a cadeau from Cona to pass on to Alex. While deflecting vendors’ parries I got talking with a French visitor to Timia and an elder, and enquired about the robbery at Temet dunes a couple of weeks earlier. Who were the culprits and had they been caught? The old Tuareg shyly slid behind his cheche at the mere mention of the event while the French guy realised it was associated with the ‘Mme Tortoise’ he’s heard so much about in the village. I’d already asked Hans our guide but he’d pretended not to understood me (it happened sometimes). I never found out if the rest of our group knew of the raid (known chiefly to the Saharan web community) and if they were at all bothered about it. Two months later another tourist group in local cars was attacked close to where we spoke – at that time bad news for Niger tourism. The volcanic geology is interesting around Timia, including the cascade which reminded me of Mutujulu Springs running off Uluru. At this beauty spot an orderly line of vendors sat behind a line of rocks imposed by the European agencies on pain of eliminating the site from their itinerary. Next day we visited the surprisingly substantial (horizontally, that is, not vertically) ruins of Assode, the old capital of the Air before Agadez became pre-eminent a few centuries ago. With that ticked off, by lunch time we watched the women watering their goats at Tchintoulous well, enjoying rather more tranquil vending opportunities as they discreetly laid out their wares near us. At the top end of the Zagado valley (picture, top of the page) we spent out last night in the Air facing the Taghmert plateau and the dune fields beyond. The following morning the cars caught us up as we took our morning stroll and led us through a narrow chasm and out into the open. Our destination was the crab’s claw formation of Arakao nearby, though to get there required heading out into the dunes and approaching the entrance from the east. On the way we came across several other tour cars; our drivers always took the opportunity to stop, light up and swap news. We were following the well-carved tram lines of the Standard Tenere Loop which remained evident for much of the tour. Almost every day we encountered other groups which made me appreciate how wild the Sahara of the Gilf really was. We were now traversing the Neolithic borderlands of the western Tenere and soon pre-Islamic tombs became discernible on the hillsides. Stops hereabouts revealed the usual Neolithic artifacts and at one point I found four grinding stones, their easily found milling-stone (or moule) counterparts having long ago been grabbed by collectors. Some consider the collection of Stone Age artifacts tantamount to grave robbery but to be me they’re just non-degradable Neolithic relics that tell a story and can be aesthetically pleasing. Finding it is a lot more satisfying than haggling for a Tuareg cross of doubtful authenticity and more acceptable that pinching Tuareg heirlooms. But, although the collection of artifacts was not discouraged on our tour, I’ve changed my mind on this practice now. 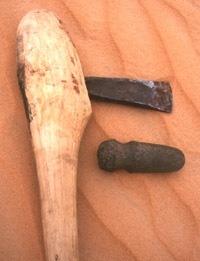 Leave these things in the desert – in many countries it has become illegal to remove them. A tongue of jumbled dunes reach through the mouth of the cirque of Arakao, dividing the easily-visited south side from the less accessible northern half. We camped on the crest of the dune cordon and spread out to explore. As one would expect, a sheltered site like Arakao was heavily inhabited during Neolithic times and probably long before that. We inspected several tombs in the southeast corner and kicked about for more artifacts, usually made from the distinctively green flint-like jape rite found in the region. Hans, always energetically scanning the sands, found me an amazing rod of fulgarite in the dunes – a brittle, pencil thin tube of petrified sand caused by a lightning strike (see the book, p.374). Since I first found some on the edge of Algeria’s Oriental Erg years ago (without knowing what it was) this stuff has always amazed me – a wonder of nature. Walking back from a dune summit I found Hans’ spot and excavated another slender undisturbed branch over half a metre long – who knows how deep it went. Traditionally Ibrahim always bakes a pizza at Arakao we were told, following the circular theme. A thick and chewy Margarita the size of a Land Cruiser wheel is quite an achievement using just enamel trays and embers, and while we all gave him full marks for audacity and the result looked incredible, sadly the dough did not quite rise. 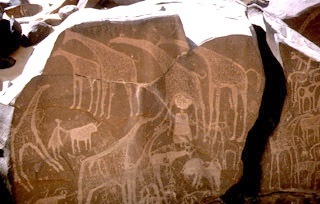 We cruised down the east side of the Air, stopping to admire the amazingly prolific engravings at Oued Tanakom and Anakom, at times driving continuously over stones all fashioned into tools over the millennia. One can visualise the Neolithic settlements spread out by a long gone river running out of the mountains, while wild game and herds grazed on the plains of the Tenere now covered in sand. At ‘Long Stones Pass’ we could make out the mass of Adrar Madet and the Erg Brusset to the east, and later that afternoon finally shook off the Air’s margins and headed across the serir for the Tree. To finally see the Arbre du Tenere after reading about it over the years was quite a buzz. These days there’s a lot more there than just a bad well and the old metal tree (the original is in Niamey Museum looking as interesting as a bag of crisps). Some Japs recently built a wacky pylon and there is the usual litter, other structures and a water tank. There are even a couple of new trees (“tropical species, pah!” exhorted our biologist Hans) which you’re asked to water when you are there. As Tony Gastel reported, the water is far from ‘ tres mauvais’ as the 953 map states, but it is very deep, taking three men to haul up the bucket nearly 150 feet. While they watered the cars we had a chance to wash and then headed into the gassis towards Fachi. At first we drove over irritating tussocks of vegetation and I had the impression we were going south. A lunch time GPS check proved my preternatural sense of direction correct, Abdulai the local guide having deliberately dropped a few gassis to pick one which lead directly to Fachi. But soon the vegetation disappeared and we were along among the low, pale yellow dunes of the northern Bilma Erg with very few tracks and no balises. To me, sat in the passenger seat, the driving and navigation of this famous route appeared relatively easy, with the odd stickage easily reversed. Occasionally we came across an old azelai camp with masses of camel dung and other rubbish, and a little later some abandoned kantus (salt pillars) with the dead camel that could no longer carry this load nearby. But we encountered no actual caravans as Tonyhad last October – the azelai season. Some gassis harbour the odd patch of Neolithic chippings and here we found tiny arrowheads – something I thought all but impossible with casual fossiking. The fine craftsmanship and variety of these centimetre-long spikes is nothing short of amazing. They may only be a century old of course. Measuring time in terms of progressing civilisation depends on where you are – one of our driver’s father used stone arrowheads to hunt while at the same time in Algeria they were using bullets. We camped in the lee of a seif dune. Next morning we approached Fachi – lovely in Jean Luc Manaud famous postcard/calendar but well camouflaged below the Agram falaise. The sand-filled streets and tamarisk trees give Fachi a nice, ex-colonial appearance. This was Kanuri country, not Tuareg though Hans suggested that Kanuri are merely Tubus of the Kaouar region of eastern Niger. I have read though, that they like to deny this. We got watered at the well, checked in with the sultan who was entertaining a Spanish TV crew, and then went for a look around the old town escorted by the sulky sultan’s son. Although I find old ksars as emblematic of the Sahara’s romance as anything, the giant urns inside the old fort was about as interesting as Old Fachi got. Back by the cars we were left to stew among the cadeau kids until nice and tender. I went for a wander up a street, looked down an avenue and got spotted whereupon a tidal wave of kids surged towards me and I chuckled. I would not be surprised if each of us was asked 50-100 times for bics or whatever. It’s all part of Africa of course (though not the true desert one likes to think) but what was the delay? It was clear that the group was irritated by it, having been unmolested since Timia a few days ago. After a visit to the salt evaporation pits (salines) round the back and lunch in the palms north of town, we headed up over a sandy pass through the Agram where the sand softened noticeably. All the cars struggled and Kaiou’s red Cruiser – which at the best of times smoked like a Ukrainian steelworks – started frying its clutch. We could smell it burning in our car but he kept pushing it and eventually it disintegrated to bare metal. Luckily Abdulai has a spare and with the aid of ropes, two jacks and some legs, Kaiou’s Cruiser was running again four hours later. The cars drove in strict formation. Abdulai up front, Madougou with us in the Patrol and Kaiou last. But Madougou was a bit slow and sometimes Kaiou got ahead, belching his unburned black puke all over us. Sensing our irritation they halfheartedly tried to fix it later, but after all, the car ran so what’s the problem? Worn diesel injector pumps are a problem in the Sahara and the mixture on his car was far too rich and Kaiou ran out of fuel before Bilma. Bilma is easy to spot with the ridge of the Kaouar behind it. In fact I had the impression that crossing from the Tree was relatively easy. The gassis line up just right and in good visibility you can’t miss the Agram or Kaouar falaises. Finding the Tree without GPS if coming in the other direction would not so easy, but even then, grasses and converging tracks would be a clue that you’re close. Hans described Bilma as a dead town and I find Tony’s figures of 12,000 population rather unlikely (for the whole massive Bilma arrondisement [district] maybe). We stopped at a garage for water. An HJ75 was getting fresh oil and a 109 Land Rover waited outside with its lid up. On this side of the Tenere you find plenty of Nigerians washed up on the road to Libya and so English is spoken, but as in much of West Africa, everyone speaks several languages. Our guides chatted in a mixture of Tamachek, Arabic, French, Djerma, Hausa and Tuburi (or ‘Kanuri’). With the jerries full we drove round to the fort to hand in our passports and pay the provincial tax. Our here you officially need stamps in Bilma, Dirkou and Chirfa which takes up a good page or two of your passport. Near the fort are a couple of market stalls full of Nigerian goods and junk sold by Hausas who, I get the impression, are the ‘trading Moors’ of this side of the Sahara. Knowing this, kit made sense to discover that the famous Bilma salt caravans are organised and assisted by Hausa or Peul, not Tuareg, though Tuareg camels and guides are of course hired. And the good news is that these caravans are far from the dying tradition many think. Tony’s reports of seeing several caravans was no fluke. Next day we hit Dirkou – a thriving frontier town that is the true capital of the Kaouar. Nigerians and other desperadoes head north on top of the lorries to a life of slavery in Libya, only to get sent back following one of Ghadafi’s strops, sat on the piles of subsidised or stolen goodies that pass daily through Dirkou. By the compound where Andy and Richard enjoyed their Dirkou detention is a Tubu gun carrier shot to smithereens and left as a reminder that the government won the rebellion. Passports handed in, I had a choice to go see Jerome or check out the town. Lively though Dirkou looked (and free of hassle I was told later) I went up to pay my respects to the late Diesel Prince of the Tenere, finding a friendly old man instead of the money grabbing Shylock I’d expected. He can afford to smile of course, selling Libyan fuel at a 1000% mark up but still a tad less than the official Nigeran price. A big Merc was unloading and I got talking with the driver who originally came from Djelfa in northern Algeria, while his two boys bounced oil drums off their heads, Tubu daggers tucked in their belts. He was full of praise for ‘Le System Mercedes’ but didn’t have much to say about the run down from Sebha that I could understand – some diesel may have seeped into his brain over the years. Although now 75 years old, Jerome was more lucid and delighted to meet a Brit – claiming to have fought for Monty at El Alamein and all the rest. He rolled off a whole string of generals’ names and dates which sounded plausible, but later Hans suggested had I been German it would have been the same story under Rommel. In fact a mate who has since met Jerome found out he is indeed an Anglophile, proudly showing an old WWII photo of himself in a Brit uniform. Another S-Files Tenere contributor, Gerbert interviewed Jerome for a Dutch paper a year or two ago. He died in 2003. Back with the group, Luggageless Erich had bought himself a Hausa outfit, complete with hat. Erich was a penny short of a pound following a bungled operation in his early forties, and was quite a laugh in a subversive, boyish way. Vendors zoned in on his naivete and he ended the trip, grinning and draped in Nomadobilia. The landscape of the Kaouar is a bit grubby and grey for my liking. We dropped into the salines north of Dirkou where natron salt was mined. I noticed Madougou took some with his chewing tobacco as they do in these parts. By the time we got to Yeguebba – the northern end of the Kaouar escarpment – the colour of the sand was a pleasing orange. We stopped to collect some firewood (there’s plenty of firewood here and masses in the Air) and drove across the soak where the last car mired. What a mess, the quicksands wobbled like jelly and it makes you appreciate how easy and clean dry desert sand is to get out of. But with sand plates and a tow he was out and we spent the night nearby in the rocks where a fennec (desert fox, sort of) popped in for a visit. Since Bilma it was clear that our drivers were getting tired and probably anxious at being out on the far side of the Tenere in their old bangers. Their banter was restrained and you could see they longed to be back in their own territory. We were having an easy time of course, waited on hand and foot and with nothing to worry about other than, for some, getting the best camp spot for the night. I could not join in the evening chatter much but it didn’t bother me, though I can now say ‘spoon’ in German. Anyway, with time to myself I had a fresh batch of hare-brained schemes to nurture through their delicate development stage. Hans was a great guide and had a good way of melting the ice at checkpoints by bringing photos from previous visits. At the Chirfa control post, where the guys in their football kit always have a gun close by, the photos caused much delight, as they did in Chirfa village where we picked up some water and veggies from the garden. All through this trip it was clear that Suntours has developed a close rapport with many communities and individuals over the years. At many places Hans discreetly handed over medicaments to the village pharmacy (eye drops and aspirins were much in demand). I’d been urged to make sure our tour visited Old Chirfa (aka ‘Tebeza’) a short distance from Chirfa village, and sure enough, it was on our itinerary. The old citadel is part of a string of medieval fortified towns that run up from Seguedine and maybe once even Bilma and beyond, tracing a defunct trading route which explorers Clapperton and Oudney followed in the 1820s down to Lake Chad, later followed by Hans Vischer in 1906 (see Shadows Across the Sahara). Strolling around Old Chirfa was amazing but for me the true highlight of the trip, as expected, was Djado, the following morning. Djado (photo Klaus W.) is a huge complex which must have housed thousands a few centuries ago. In winter it’s surrounded by a lake of brackish water which – oddly – disappears in the rainy season. 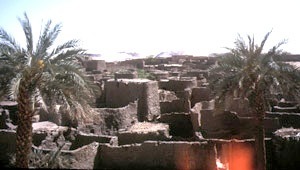 In autumn the whole of Chirfa moves here to harvest the dates from the many palms; their zeriba huts ring the evocative ruins. Exploring the crumbling town was incredible, every corner revealed a stunning view of distant escarpment, sands and waving date palms. My camera had passed out in Fachi but luckily Klaus had a bag full of lenses and film and agreed to keep shooting for me. Hans poured scorn on the theory of pseudo archeopologist Uwe George who found a room with a cross relief (now called the ‘eglise’) and who went on to claim that Christians migrated here from Ethiopia in the first millennium. I’m all for interesting theories but it does indeed sound rather implausible and has diminished my respect for Geo magazine who employ him (I’m sure Geo are quaking at the very thought!). Ahead of us rose the massive monolith of Orida prominent since yesterday, and behind it the arch of Orida and the alluring rim of the plateau beyond. The landscape and colours evoke the tassilis of the N’Ajjer and Akakus with which the Djado plateau is contiguous. Most Ewaden guides won’t come this far into Tubu territory [at that time], let alone the intriguing Enneri Blaka, but if you don’t happen to make it to the arch on your visit you’ve not missed much. Lunch was under the palms near the wonderful aforementioned Djaba. Some Tubu girls parked up and set up their trinkets on a mat. This sort of souveniring was always much more agreeable and relaxed than the outnumbered hectoring we got in the villages. We returned to Chirfa to pick up more water and our passports and then headed out along the Djanet track to the Col de Chandeliers (aka ‘Pass de Orida’). A cozy camp was set up among the rocks while to the west the plain of the Tenere du Tafassasset spread out like a becalmed ocean. It’s a corny simile for the desert I know, but this is the first place I’ve seen in the Sahara where it was appropriate. This was the real Tenere – a word usually used to describe the whole of northeast Niger and the Tamachek translation of the Arabic ‘Sah’ra’ or empty quarter. The awe of this emptiness was lessened again next day by the clear twin tracks running west to Arbre Perdu and on to the isolated hills of Grein. But further on, beyond the northern outliers of Erg Capot Rey, even the tracks and wind-aligned ripples disappeared until it was hard to tell we were moving at all apart from the drone of the engine as it hit a soft patch. Running at these high speeds caused a new set of problems for the aged Toyotas and while a puncture was fixed, Ibrahim prepared a quick lunch in the shade of the cars. 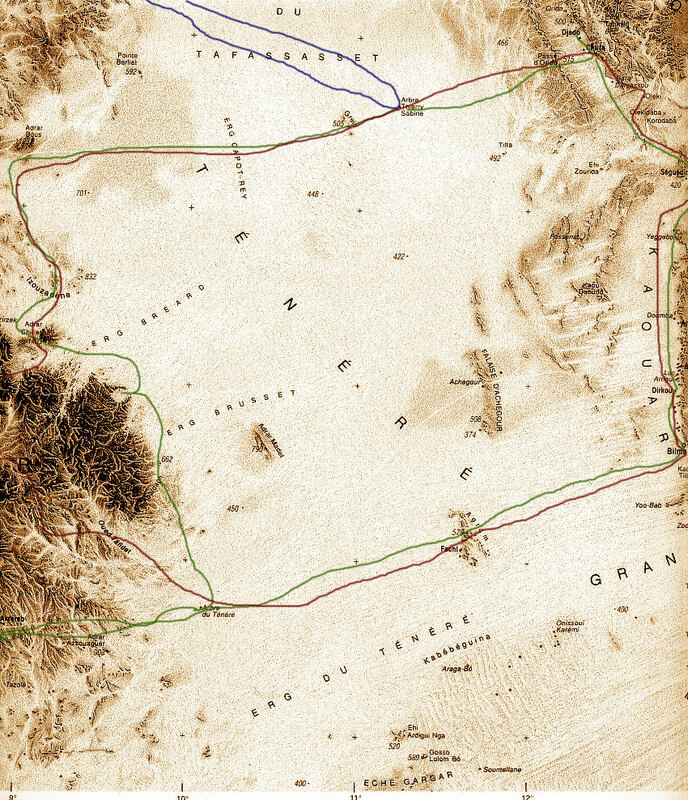 We continued west through the void and in the late afternoon the profile of Adrar Bous mountain loomed out of the haze 45km away. Bous is well known as a locality of Neolithic knick-knacks and we parked up by a Stone Age ‘chip pan’ and shuffled around for more arrowheads, then camped in a sheltered creek – an old Tuareg hide-out from the days of the rebellion. All of our crew were former rebels who’d fought in the bitter war of the early 1990s. Since then the Tuareg of the Air have won some concessions on the organisation of tourism – the whole of Niger’s tourism depends on their kudos after all – but in the poor villages of the Aïr, aid still struggles to make much impact. All the better then is tourism like this where our money goes straight into the hills. From Adrar Bous we were back on the tramlines of the Loop which winds down the east side of the Air into the dunes of Temet where the Austrian and American groups had been robbed a couple of weeks earlier. I’ve since got the full story from one of the people involved and it was no hit and run raid, but a thorough and thoroughly intimidating robbery of all involved, and in which the drivers of the American group from Dunes Voyages excelled themselves in stopping all the cars being taken. It’s no surprise to hear that it may have been renegade Malian Tuareg who were the culprits – they’ve been behind most of the tourist (and rally) raids over the last couple of years. I’ve since read the ‘leader has been caught’ – hopefully not just any old Tuareg in the wrong place at the wrong time. Since then there has been another raid of a German group in Timia in March. We had lunch at the site of the robbery and I probed our drivers, but did not get much of a response so left it and walked up the huge dune with the rest. A winding gassi led east out of the dunes and we spent the evening at Izouzadene, the striking outcrop of marble veined with cobalt salts known as the Blue Mountains. From a distance they do have a distinctive pale blue hue but close up the grey veins look less impressive and the masses of tracks in the area could almost make it Morocco. From here we drove south through the dunes to Chiriet, visible from the summits of Izouzadene, and providing the classic east Air panoramas of dunes lapping against a backdrop of purple-grey plateaux. Driving into the massif, Ibrahim stopped to grab a bunch of wild grass to concoct a herbal infusion for later – a change from the endless Tuareg tea we drank daily. North of Chiriet a rocky track led to Tchou-m Adegdeg well – we were now very near the point at Kogo where we’d emerged from the Air nearly a fortnight ago. Here Tuareg nomads watered their herds and a camel sipped from the bowl in which my shirt stewed in detergent. Between here and the nearby Tezerzik well is a lovely scenic drive through dunes featuring a distinctive lip below their crests. At Tezerzik the drivers bought a sheep for a tenner and slung it on the roof. At the nearby camp in the dunes I watched them slaughter and butcher it with the same casual effortlessness they’d employed to repair the clutch a few days earlier. Interestingly there’s not much blood when the throat is cut and once the hide has been peeled back the thing in hung on a stake, its ribs pulled apart and the innards removed for the drivers subsequent delectation; we got the tender meat in a cous cous. Normally I find cous cous an over-rated North African ‘must-eat’, but the way Ibrahim prepared it, both the millet and the sauce were as good as it gets. From here the desert section of the tour was over and we had a dreary three-day drive back down through Iferouane and the main track via El Meki to Agadez. The nights were irritatingly windy, but the drivers were brightening up, pleased that the run was nearly over. I had the feeling that these last days to Agadez were strung out with unnecessary stops to fill the time. The third night in yet another creek full of thorns and dung and just a couple of kms out of Agadez seemed unnecessarily stingy. In my experience a tour should end on an upbeat note if possible, not dribble away over successive days. I gather the others also complained about this retracing through the Air – for fresh vegetable they were told, but our last lunch in the bush was all tinned. 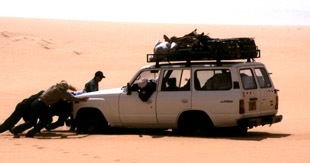 I’m sure Suntours have developed their itinerary carefully over the years, but leaving the desert at the very last minute – along the track from the Tree to Agadez for example, would have been more satisfying. We had an option for a hotel in Agadez that night and wanting to check the town out in my own time, I took up the offer with the two couples and spent the night the Hotel Tidene near the mosque. I checked out some other agencies but as advised, Agadez itself does not have much to offer. Next day the tour regrouped and set off for the long hot slog back to Niamey, getting home by the skin of our teeth following an Air Afrique strike and cancelled flights. This tour indeed proved to be a great reconnaissance of the famous Tenere I had long wanted to visit. I found the Air and its Tuareg life a little more interesting than I thought, and the run in both directions across the Tenere rather less impressive than I imagined. The whole Djado region is of course amazing, as are parts of the eastern Tenere bordering the Air, but the Tenere is no longer the wild Sahara of my imagination. TV crews and tours have put the place firmly on the map and beautiful though it is in its entirety, getting off the tracks would have been more fun, something that you can only do yourself and in good vehicles. While our crew were all great, no money seems to be invested on the basics of the agency vehicles. A Tenere fly-in tour demands a good half ton to be carried much of the time which asks a lot of a new 4×4, let alone one 15 years old and with a quarter of a million on the clock. Should I return with my own vehicle I think I’d repeat the recent tour of an Italian friend: leave Djanet without checking out and with stacks of diesel and a Niger visa and do my own thing in the northern Tenere around Grein, Adrar Bous and down as far as Chiriet maybe. If you get caught at least you have a visa and if you don’t, no one knows any better and you slip back into Algeria. If anything an independent tour is perhaps less prone to getting hijacked than the local tours which follow timetables and routes which make them predictable targets. But it is of course, still a risk that will probably never go away. I found this nice IGN half million map of the Air in Niamey. Dating from 1991, it’s a similar style to the Niger country map from IGN but I can’t say I’ve ever seen this one in Paris. In many ways it’s superior to the one million IGNs which are pretty old now and don’t show recent roads. Mine cost me 50FF, an old paperback and a small argument from the side of the Grand Hotel. This entry was posted in Desert Babbles (blog), Sahara A to Z... and tagged Adrar Bous, Adrar Chiriet, agadez, Agamgam, Anakom, Arakao, Arbre du Ténéré, Arbre perdu, Assode, Bilma, Chirfa, Col de Chandeliers, Dirkou, Djaba, Djado, El Meki, Fachi, Grein, Iferouane, Izouzadene (Blue Mountains), Kel Aïr Tuareg, Niamey, Orida, Oued Tanakom, Seguedine, Taghmert plateau, takouba swords, Temet, Tezirzek, Timia, Yegueba on May 18, 2015 by Chris S.